Houston is the fourth largest city in America and one of the world’s most diverse destinations home to eclectic neighbourhoods, a melting pot of cultures, excellent museum spaces, an insane nightlife, up-scale shopping hubs and world-class art. This metropolitan Texan city is famous for its skyline which is filled with contemporary architectural wonders, its remarkable theatre district which is buzzing all year round with all sorts of cultural events and its amazing culinary scene, with over 10,000 restaurants to choose from serving delectable dishes from all corners of the world. Brightsun Travel offers an excellent range of cheap air tickets to Houston, so you can secure a great value deal when travelling to this immense city. Houston boasts plenty of incredible tourist attractions that make for unforgettable experiences. The most famous landmark in the city is of course NASA’s Johnson Space Centre, where you can explore hundreds of space artifacts, learn all about space travel, watch space shows, enjoy interactive exhibits and admire displays of rockets and space shuttles. The Houston Museum District is another landmark of the city home to a number of museums and cultural centres, all set within walking distance from one another. Featured institutions include the Museum of Fine Arts which has over 65,000 art pieces from all across the world, and the Menil Collection which houses around 17,000 artworks including paintings, photographs, drawings, sculptures and rare books. Alongside its city bustle and excitement, Houston has an impressive number of serene outdoor spaces. Visit Memorial Park, one of America’s largest urban spaces with scenic trails, a golf course, public swimming pool, sports fields and designated picnic area. Discovery Green is another lush green space in the city with a farmers market, food trucks and pretty waterways. There’s always something exciting happening at Discovery Green Park, whether it’s movie nights, yoga sessions or live performances. Then there’s the 160 acre Buffalo Bayou Park, which has hiking and biking trails with views of Houston’s skyline, interesting sculptures, a picturesque waterway with kayak and canoe rentals, beautiful wild flowers and lots of open grassland. 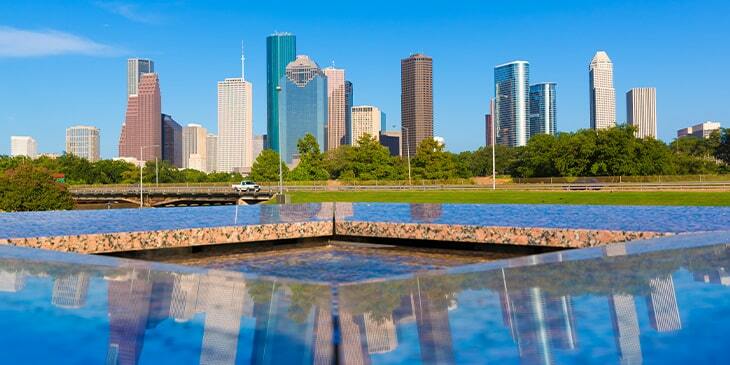 Book Houston flights from India and discover the many gems of this incredible US city.